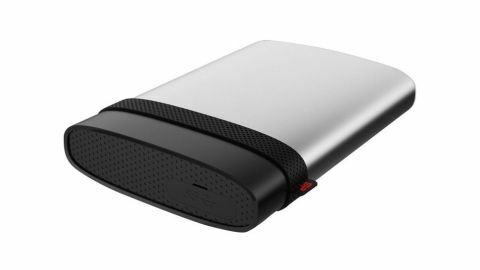 A robust USB 3.0 portable drive that performs reasonably well for file transfers, and under the harshest of environmental conditions. When the Silicon Power Armor A85 arrived, a few individuals got excited by the notion that we’d been sent a hip flask containing some rare libation. Sadly, we had not. It turned out that while being the rough size and shape of that particular receptacle, the Armor A85 is actually an external hard drive which is built to be abused beyond all reasonable expectations. The 1TB model we reviewed retails at around £78 in the UK, $75 in the US, or if you’re in Australia, it will set you back about AU$109 (drive capacities go up to 5TB at the top-end). There are only two items in the packaging: the Armor A85 itself and a short (32cm) USB cable that has Type-A superspeed connectors at both ends. The advantage of this design is never worrying about which end to plug in. However, this layout isn’t a common USB cable, so misplacing it might prove problematic. Silicon Power’s approach to avoiding that scenario is to make the join between the black cap and silver metal section a thick rubber band that you can use to hold the cable. We’re not sure how well this will work in practice, but at least the manufacturer considered that cable loss could be an issue. The USB Type-A port on the drive is hidden under a thick plug on the black cap end that incorporates a tight rubber seal. The plug looks good for keeping unwanted water and dirt out of the drive, but it’s also an excellent route to breaking a fingernail trying to pop it out. The temptation would be to leave it in the open state, but failure to replace it after use would undermine the ability of the drive to handle immersion, of course. A downside of this level of protection is that if the drive dies inside its cocoon, that’s where it will remain – no practical means to extract it exists, at least not without an angle grinder. Beyond these points, there is relatively little to say about this design, other than it’s built to handle abuse rather than win any style awards. On one level the A85 Armor is just a hard drive stuffed inside a thick metal tube. However, that thinking entirely ignores all the tricky technical details the Silicon Power engineers had to resolve to make that work. Like avoiding overheating issues with the drive in an enclosed metal space, and cosseting the drive from accidental assaults of water, dust, and the general trials and tribulations of careless ownership. The solution wasn’t subtle, and primarily involved the creation of a gently curved aluminum tube and a rubber sleeve that isolates the drive from whatever is happening physically to the outer case. The engineers also created a suspension system that isolates the external connector from the floating internal hard drive, an obvious point of potential failure. Engineered in this fashion, the Armor A85 survived the MIL-STD 810G Method 516.6 Procedure IV, aka the transit drop test. And Silicon Power’s promotional material claims it can withstand 500kg of force, should something unfortunate happen to it. The promo bumph also shows pictures of a car on top of the drive, though we should point out that most cars weigh much more than 500kg, even if the mass is distributed between multiple wheels. As tempting as driving over the device a few times before benchmarking was, the three-year warranty and its ability to handle MIL-STD 810G convinced us that the A85 is tough in more than the looks department. The transit drop test is to perform 26 drops on each face, edge, and corner from a height of 122cm above the floor. And all those test drops can only be divided among five test items. The device must also survive a single 3m drop test and still be functional afterwards. Having compliance to IP68 in this context means the device should be dust-proof and protected against immersion in water for more than 30 minutes at a depth of up to 1 meter. A reasonable assumption for this test is that the immersion would take place with the USB cover in place, and therefore not connected to another device at the time. Regarding endurance, the Armor A85 certainly talks-the-talk, but can it walk-the-walk? In previous designs, Silicon Power has used Seagate's Momentus drives, and we suspect that’s what is inside here too. We only got to test the 1TB model, but as mentioned previously, the same outer shell is used with a range of drives up to 5TB. The only difference, other than the capacity, is that the larger versions are marginally heavier. Performance isn’t SSD level, but it’s more than acceptable when compared with many portable drive solutions that use conventional drive technology. CrystalDiskMark rated the read speed at 119.3MB/s and the write speed at just a little less: 118.4MB/s. To achieve those levels you’ll need a USB 3.0 connection with USAP mode active – it should be natively on any Windows 8.x or Windows 10 installations with the right hardware. Normally, the suppliers of review equipment to TechRadar Pro expect us not to intentionally abuse their device because they’d like it back at some point. However, the representatives of Silicon Power specifically told us to get the A85 wet, and unbelievably, drive a car over it. So obligingly – post-benchmarking – we did. Unsurprisingly, the car exercise did leave some minor abrasions on the Armor A85, but it didn’t stop working. It also survived complete immersion in water, though it’s worth noting that it doesn’t float. That’s an issue because dropping it into a depth of more than 3-foot might be catastrophic even if it can be successfully retrieved. As far as performance goes, the A85 does what it says on its rather thick aluminum tin. This isn’t the quickest external drive we’ve tested, but the Silicon Power Armor A85 is undeniably one of the toughest. If you’re taking a trip where data loss might result from dust or water penetration, then the Armor A85 is an affordable solution that can withstand plenty of punishment (maybe Black Friday will see its price cut further, too). The only significant caveat is that the drive doesn’t float, so dropping it into anything other than shallow water could be its undoing without some kind of extra means of floatation being added.